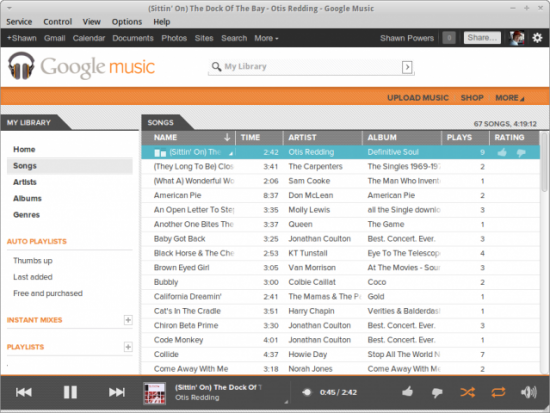 Nuvola Player (formerly known as google-music-frame) is a Linux application that integrates cloud-based music services into your Linux desktop. I've tested it only with Google Music, but Nuvola now supports Google Music, Grooveshark, Hype Machine and 8tracks. It also supports Last.FM scrobbling. What makes Nuvola better than a standard Web browser is that it integrates with the Linux desktop. Nuvola gets its own tray icon and supports multimedia keys on keyboards that have them. I traditionally store my music files in Dropbox, but since Google Music has excellent support on Android phones, I find myself using the cloud-based service almost exclusively. Nuvola makes that experience much nicer. Check it out at https://launchpad.net/nuvola-player.